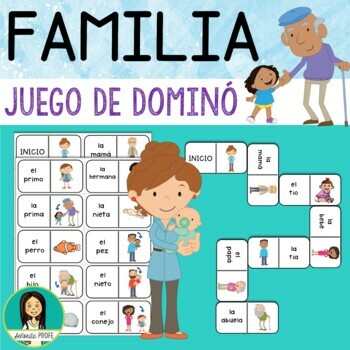 This adaptation of the popular domino game will help your students practice the vocabulary in a fun way! In order to play, students need to know the vocabulary! 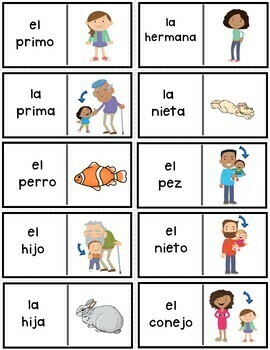 Free “La familia” vocabulry guide available HERE. Instructional video available on my YouTube channel! Decide which style to use and how many sets you will need. Print on card stock (if available). I like to print each set in a different colored paper to avoid the sets getting mixed up. Laminate for durability and cut out the cards using a paper cutter. Place each set in an envelope or Ziploc bag. Punch a hole in the Ziploc bag to get the air out and flatten! Play in groups of 2-4. The more students per group, the shorter the game. Fewer students means longer game as they’ll each have fewer cards. The dealer shuffles and distributes the cards one at a time until there are no more cards. 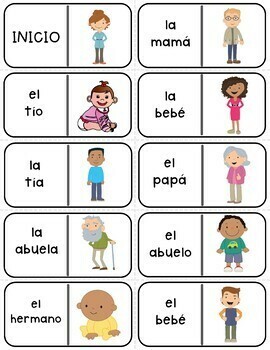 The person with “INICIO” places that card down to begin. Players observe their cards to match vocabulary to picture. Encourage students to say the name of the picture aloud to practice pronunciation. The game is over when the “FIN” card is placed down. There’s no particular winner in this game. Just have fun and practice the vocabulary! If there’s extra time, students can shuffle the cards and play again!